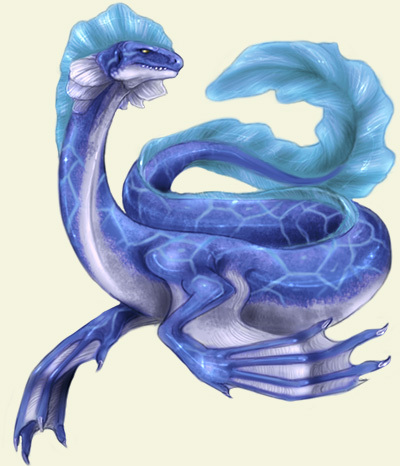 Beautifully colored indigo and light blue, this creature feels silken smooth to the touch, its long crest delicate and thin. You are not fooled by its seemingly fragile appearance; coiled muscles and long tail can easily take down a ship, though this leviathan spends its time hunting for exotic plants to eat along the bottom of the lake. Commonly found in the same locations as krakens, leviathans live in oceans or seas, but can frequent any body of water. Sailors told tales of boats being taken into watery depths by these massive beings, but leviathans only attack when provoked, or when the areas near their young are disturbed. With two webbed arms and a long, serpentine tail, leviathans travel at great speed and are great help to magis concerning matters of the sea.